No pizza. No boyfriend. (No life.) Okay, so during Ramadan, we're not allowed to eat from sunrise to sunset. For one whole month. My family does this every year, even though I've been to a mosque exactly twice in my life. And it's true, I could stand to lose a few pounds. (Sadly, my mom's hotness skipped a generation.) But is starvation really an acceptable method? I think not. Even worse, my oppressive parents forbid me to date. This is just cruel and wrong. Especially since Peter, a cute and crushable artist, might be my soul mate. Figures my bestest friend Lisa likes him, too. To top it off, there's a new Muslim girl in school who struts around in super-short skirts, commanding every boy's attention--including Peter's. How can I get him to notice me? And will I ever figure out how to be Muslim and American? 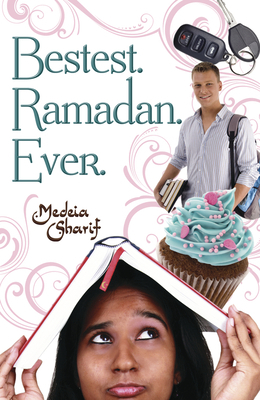 Medeia Sharif (Miami Beach, FL) is a Kurdish-American author and high school English teacher. She received her master's degree in psychology from Florida Atlantic University. Bestest. Ramadan. Ever. is her debut novel.